Chihuahuas grow more quickly than some other breeds. 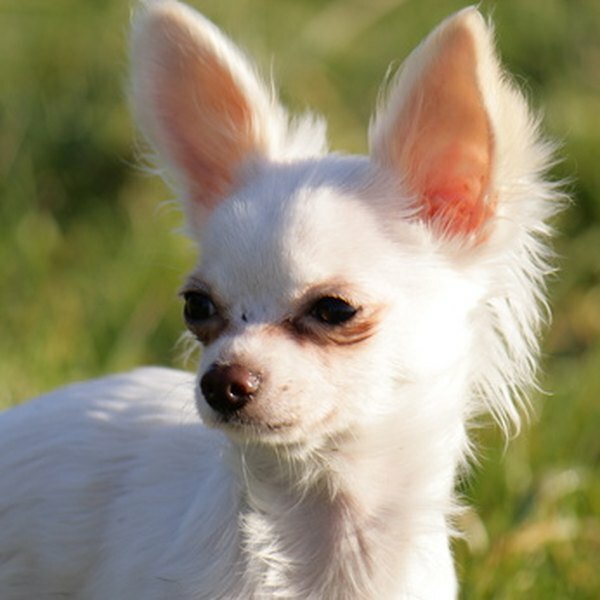 The Chihuahua is the smallest dog breed and must not weigh more than 6 pounds as an adult, according to the American Kennel Club's breed standards. Toy breeds grow more quickly than larger dogs, and your Chihuahua will be close to her adult size when she is 6 months old. The size of your puppy as a newborn is a good predictor of her adult size. Chihuahuas generally range from 2.5 ounces to 6.5 ounces as puppies, and heavier puppies tend to weigh more as adults. Comparing your puppy's size to her littermates' size can give you a rough estimate of how large she will be relative to other Chihuahuas. While much of a Chihuahua's growth is determined by genetic factors, early environmental factors also affect growth. Puppies who nurse frequently in the first weeks of life get better nutrition and are more likely to grow quickly. A healthy diet after your puppy is weaned can also affect her growth rate. Puppies who don't get enough food or who get low-quality food may end up smaller. Overfeeding can cause your dog to become obese. Medical conditions may also affect growth. Chihuahuas who are sick in the first few weeks of life tend to be smaller. You can estimate your puppy's adult size by weighing her at six weeks. Be sure to get the weight in ounces, since Chihuahuas don't grow very large and a few ounces can make a difference. Double this number and then double it again. For example, if your Chihuahua is 24 ounces at six weeks, double it to get 48 ounces, then double the number again to get 96 ounces. Divide this number by 16 to get your dog's weight in pounds. The 24-ounce puppy will be about 6 pounds as an adult. Chihuahuas tend to grow most rapidly between birth and 12 weeks. Thus good nutrition and proper care is especially important during this time. Your dog's growth will begin to slow between 12 weeks and six months, and by six months your dog will be close to her adult size. Chihuahuas are considered adults and are fully grown at one year. Lakeside Animal Clinic: How Much Will My Puppy Weigh When He Is Full Grown? Chihuahua Dogs; Bill Sawyer et al. At What Temperatures Should a Short-Haired Dog Wear a Jacket?